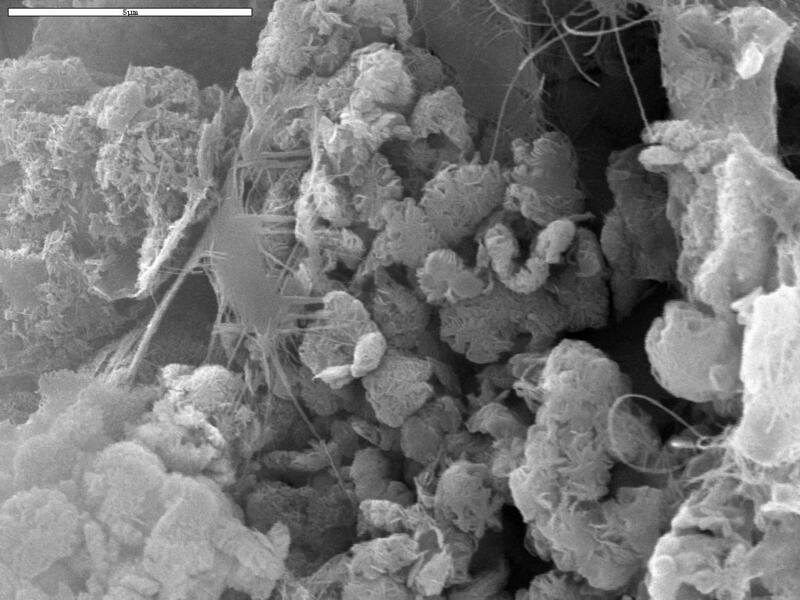 Closeup SEM image (7500x) of rubbly area rich in iron oxides in previous image of black corrosion residue from Snowing Passage, Southwest Branch. Samples are Au-Pd coated. Photo by Diana Northup and Mike Spilde. 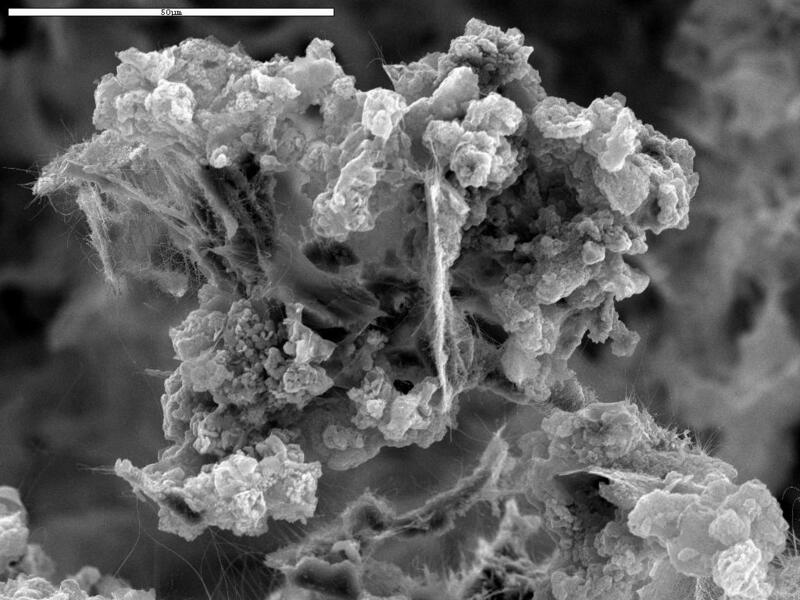 SEM image of a pit filled with iron oxide nodules in a rock sample from red-colored rock wall in an area of heavy corrosion residue in the EA survey. Photo by Spilde, Northup, and Boston. SEM image of an accumulation of iron oxide crystals. EDS analysis shows Fe and O, with a little Ca and Al. Photo by Spilde, Northup, and Boston. EDS spectrum of bright particles on gypsum sample from EY56 in the Western Borehole. Note presence of strong iron peak and some vanadium. Samples are Au-Pd coated. Analysis by Spilde, Northup, and Boston. EDS spectrum of bright particles on gypsum sample from EY56 in the Western Borehole. Note presence of strong iron peak and some clay elements. Samples are Au-Pd coated. Analysis by Spilde, Northup, and Boston. EDS spectrum of bright particles on gypsum sample from EY56 in the Western Borehole. Note presence of strong iron peak and some clay elements and vanadium. Samples are Au-Pd coated. Analysis by Spilde, Northup, and Boston. EDS spectrum of bright particles on gypsum sample from EY56 in the Western Borehole. Note presence of strong iron, oxygen, and calcium peaks and some clay elements, vanadium, phosphorus. Samples are Au-Pd coated. Analysis by Spilde, Northup, and Boston. EDS spectrum of bright particles in outer wall rock sample from EY56 site in the Western Borehole. Peaks include iron, vanadium, oxygen, silicon, and aluminum. Samples are Au-Pd coated. Analysis by Spilde, Northup, and Boston. EDS spectrum of bright crystals the outer wall rock sample from EY56 site in the Western Borehole. A strong iron signal is observed. Samples are Au-Pd coated. Analysis by Spilde, Northup, and Boston. EDS spectrum of red clay-like corrosion residue (sample RL4) from Red Lake passage in the Western Branch. Possibly a smectite or illite clay. Samples are Au-Pd coated. Analysis by Spilde, Northup, and Boston. EDS spectrum of red clay-like corrosion residue (sample RL4) from Red Lake passage in the Western Branch. Analysis is of a bright areas on back-scattered detection and shows more iron than the preceding sample area. Samples are Au-Pd coated. Analysis by Spilde, Northup, and Boston.